One of my favorite things about living near the Gulf is that the beach is so close to us. There is nothing better than relaxing in the sun, digging your toes into warm sand and spending the day with friends. Beach trips require an adjustment in thinking about what foods to pack for a lunch, however. That means you don’t want snacks that will wilt in a cooler on a hot day or use food containers that will let sand inside. And you don’t want to have to deal with a lot of utensils or dishes. Hands-down the most obvious beach must-have is bottled water. Without adequate hydration, you run the risk of heat stroke. Do not forget the sunblock, either. I have seen too many people turn lobster red before the end of the day. By bringing snacks like nuts and dried fruits, which are packed with protein and carbohydrates, you’ll have delicious and easy snacks that will give you energy all day long. Pita, pretzels and chips are all delicious with dips like hummus or salsa, but dips are not the best idea for a snack at the beach. One gust of wind and you may get more sand in the container than you want. The less exposed your food is to the elements, the better. Mayonnaise does not hold up once it leaves the refrigerator. Instead, opt for a vinaigrette or use sandwich condiments, like pesto, to add flavor. Dairy products are best left at home, as they are highly unstable if not kept at the right temperature. 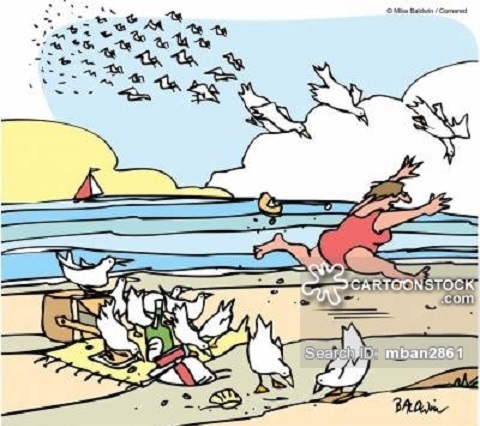 Think of healthy, but filling food to take to the beach. Choose pita bread or wraps for sandwiches instead of bread slices that may get soggy. Keep all condiments separated from other food. Use small Tupperware containers for sauces or dressing. 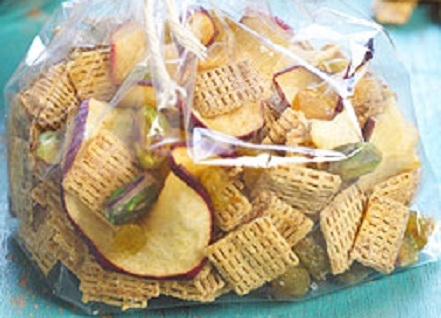 Pack light and non-salty snacks for kids in individual ziplock sandwich bags. Prepare chopped fresh vegetables, like carrot slices, red, yellow and green pepper sticks, cherry tomatoes, celery, crackers and raisins that can be enjoyed as a small snack. Try to create snacks that are based upon finger foods. Fruit that can be eaten out-of-hand, like grapes, apples, pears and peaches along with cheese that isn’t too melty — cheddar, Swiss and Gouda, for example, are best for the beach. Cookies and brownies are best for dessert. How to pack the cooler. 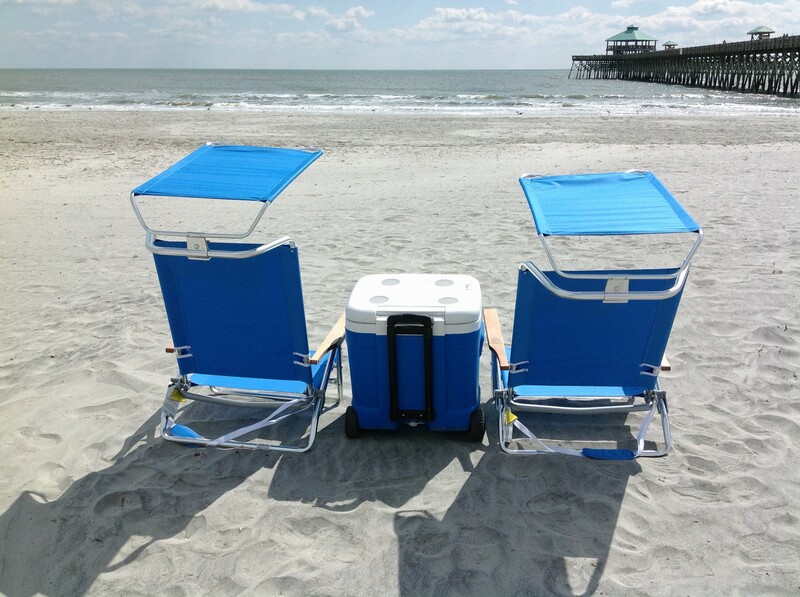 Start with a great insulated cooler. Make sure it’s size appropriate for your entire family. It gets pretty tiring lugging lots of bags from the car to the sand. Food and drinks that are going to be used last should go on the bottom of the cooler. You don’t want to be digging through the ice or other items just to get one thing. Place the heaviest and biggest items on the bottom, while the lightest and smallest items should be placed on the top. Always add ice cubes or ice packs to the cooler after the items have been added to act as a buffer between the food and the heat. Baby wipes are recommended to take with you to the beach. Unlike napkins, baby wipes help to moisturize the skin and they remove sand more efficiently than dry cloths or paper napkins. Take extra plastic bags with you. To minimize trash blowing away and litter in general, you can easily place your trash in the plastic bag. Toss the entire bag in a nearby trash barrel on your way out. Be sure you wrap up raw meats and pack them with individual ice packs. Make sure your cooler can keep any raw ingredients cool enough, long enough. Marinate meat the night before, since the marinade will help preserve the meat. Bring vegetables, like bell peppers and corn on the cob, to give you some variety on the grill. This will satisfy any vegetarians in your group and it will also free up space in the cooler since veggies don’t need to be kept cold. Frozen fruits serve double duty. As an alternative to ice cubes, freeze grapes or berries, then add them to your cooler when you head to the beach. Not only are frozen fruits refreshing, but they will also help keep the temperature down in a cooler. In medium bowl combine cereal, apple pieces, nuts and raisins. Divide evenly into 6 sandwich bags. In a small bowl combine oil, lemon juice, paprika, salt and pepper. Place chicken on the unheated rack of a broiler pan. Brush both sides of chicken with the oil mixture. Broil 4 to 5 inches from heat for 7 minutes. Turn chicken; broil 5 to 8 minutes more or until chicken is no longer pink. Cool slightly; cut into strips. 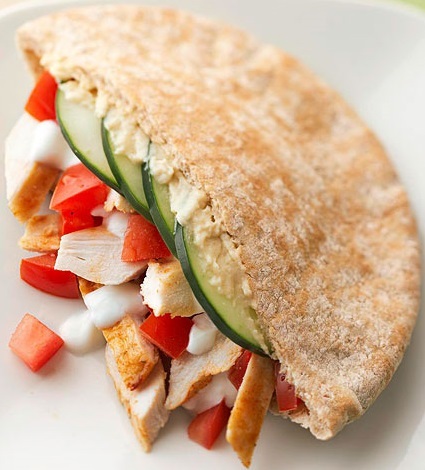 Carefully open pita halves and spread each with a ¼ cup of hummus; add sliced chicken, tomatoes, cucumber and yogurt. Wrap each sandwich well in aluminium foil. The foil will help hold the sandwich together while you eat it. Peel cucumber. Cut cucumber in half lengthwise and scoop out seeds. Thinly slice cucumber; set aside. In a small bowl stir together the cream cheese, basil and 1/8 teaspoon salt. Spread about 1 tablespoon cheese mixture on one side of each bread slice. 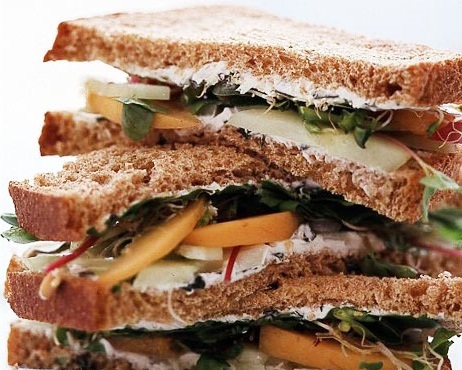 Top four bread slices with cucumber, apricot and arugula. Top with remaining bread slices, cream cheese side down. Cut each sandwich in half diagonally. Wrap well in foil. In a small bowl, combine raisins and boiling water; set aside. In a large electric mixer bowl, combine peanut butter and butter; beat with the electric mixer on medium speed for 30 seconds. Add sugar, egg, cinnamon, vanilla and baking soda. Beat until combined. Add flour; beat until smooth. Stir in oats. Drain the raisins; stir raisins and chocolate chips into the oat mixture. Bake about 10 minutes or until lightly browned. Transfer to wire racks; let cool. Pack into sandwich bags for individual servings at the beach. 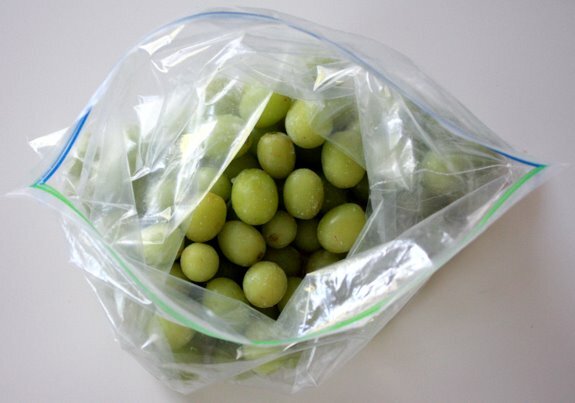 Don’t forget the frozen grapes. A few weeks ago I started receiving my weekly CSA (Community Supported Agriculture) delivery from a nearby farm. You can find more information on how a CSA works by visiting the Local Harvest site. I look forward to this season every year because I now have available the freshest produce to cook with each week. The cover photo above shows what vegetables I received in my box last week. 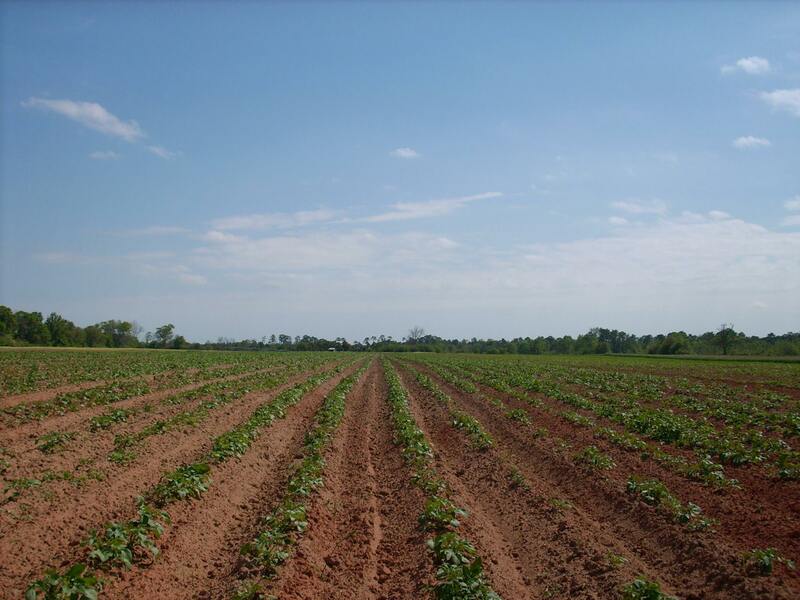 Jeta Farms is a family owned local farm, operated by Eddie Frank, and the farm sells their produce at local farmers’ markets, including the Palafox Market in Pensacola, FL on Saturday mornings. Here are a few recipes I made with the vegetables in this week’s share. Heat oil and garlic in a small saute pan. Lower heat and add the whole peppers. Saute slowly until lightly brown on all sides. Serve at room temperature. These peppers are delicious as an appetizer or as a side dish. Top with the hot vinegar mixture. Cover and refrigerate for several days before eating. 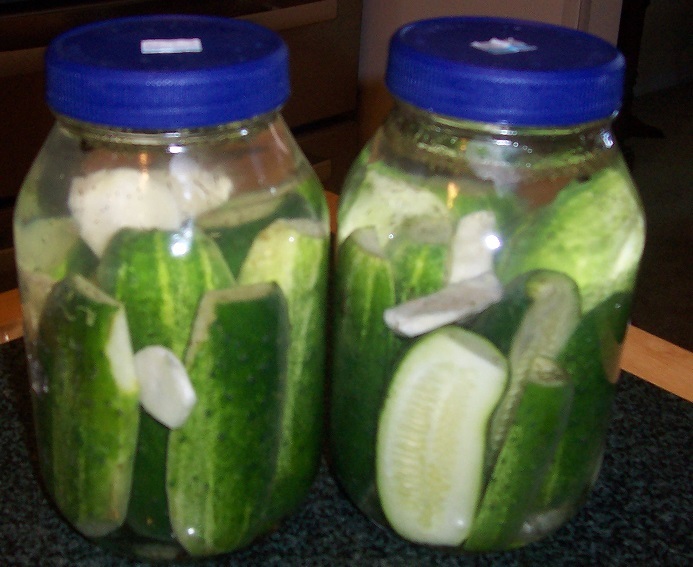 The pickles keep for a few months in the refrigerator. 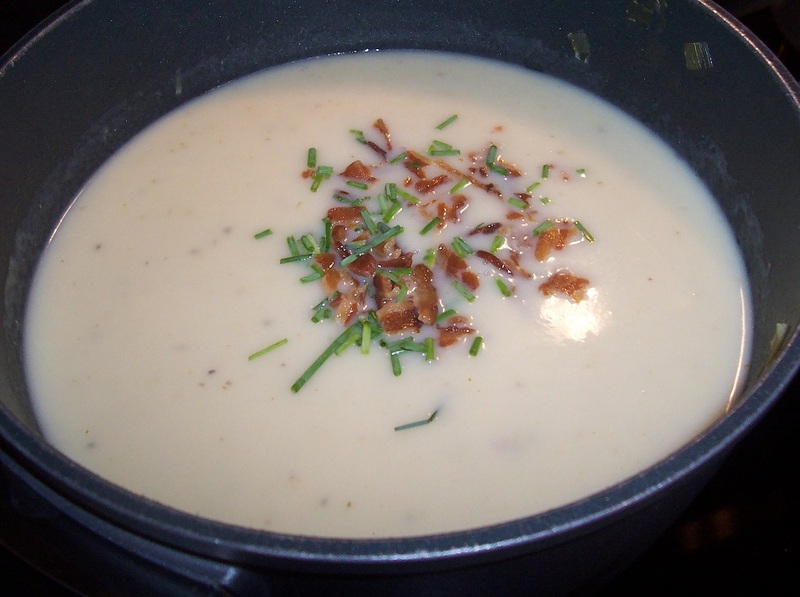 Heat butter in a Dutch oven or soup pot. Add the celery, leeks and onion and saute until tender. Add garlic and potatoes and cook for 5 minutes. Add the chicken broth, thyme and bay leaf. Bring to a boil, lower heat, cover the pot and cook until the potatoes are soft, about 20 minutes. Remove the bay leaf. Puree the soup with an immersion blender or in a processor. Add the evaporated milk, salt and pepper. Bring to a simmer (do not boil). 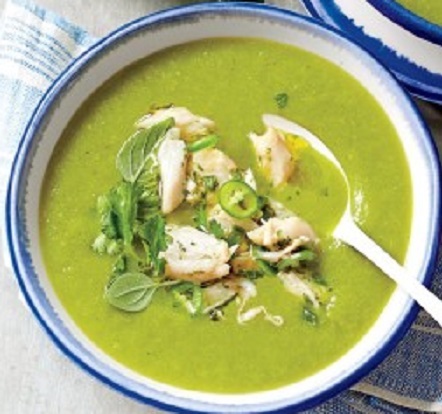 Serve in individual bowls and top each bowl with chives and bacon. This is a favorite in our family – well – anything I put basil pesto on becomes a favorite with them. Preheat grill to medium-high. Oil the grates. Combine pesto and lemon juice in a small bowl. Brush both sides of the squash slices with olive oil and sprinkle lightly with the salt. 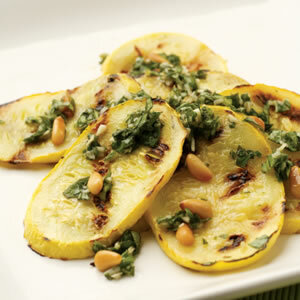 Grill the squash until browned and tender, 2 to 3 minutes per side. Serve topped with the pesto and the toasted nuts. Jeta Farms grows the most delicious eggplant, Rosa Bianca, an Italian Heirloom eggplant. 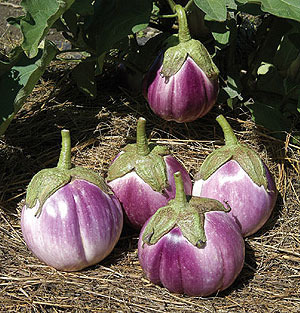 It is a medium size, round shaped eggplant with lavender-white skin and creamy white flesh with no taste of bitterness and very mild in flavor. This is my summer version of eggplant parmesan. Place the sliced tomatoes on a plate lined with paper towels. Sprinkle lightly with salt. Let the tomatoes drain while you prepare the eggplant. Dip eggplant slices in the egg substitute and then coat in the dried bread crumbs. Place the breaded eggplant on the prepared baking pans and bake until brown, about 20 minutes, turning the slices over halfway through baking. Oil an 8 inch square glass baking pan. Cover the bottom of the pan with eggplant slices and add half the sliced tomatoes and half of the cheese. Add another layer of eggplant slices, tomatoes and cheese. Sprinkle the top layer with dried Italian seasoning. Cover the dish with foil. Bake in the oven for 30 minutes. Remove the foil and bake 10 minutes more. Spray two 8-inch loaf pans with cooking spray and set aside. Combine flour, baking soda, cinnamon and brown sugar in a large mixing bowl. Stir until thoroughly mixed. In a smaller bowl combine eggs, oil and vanilla. Add to the flour mixture and mix well. Bake until deep golden brown and a toothpick inserted in the middle comes out clean, about 60 minutes. Cool in pans on wire racks for 30 minutes; then remove bread from the pans and continue cooling on wire racks. Italian Immigrants came to Wyoming in the late nineteenth and early twentieth centuries, and most worked in Wyoming’s mining industry. The bulk of Italian immigration to Wyoming was between 1890 and 1910. By 1910, 7.7 percent of Wyoming’s foreign-born population was Italian. The Italian immigrants originated from the northern provinces of Lombardy, Tuscany, and Piedmont. By 1920 more than sixty percent of Wyoming’s Italians lived in Laramie, Sweetwater and Uinta counties. Domenico Roncaglio was born in Rock Springs, Wyoming, in 1916. The son of Italian immigrants, he was known as “Teno” to his friends and later changed his last name to Roncalio. Teno was one of a family of nine children. Teno obtained his first job, operating a push cart at the age of five years. The next year he took over a shoe shine stand in a local barber shop. By the time he was sixteen years old, Teno had passed the Wyoming Barber Board of Examiners and was the holder of a Journeyman Barber’s Union card. Teno worked in the barber shop throughout his high school years but after graduation went to work on the Rock Springs Rocket as a combination reporter and advertising salesman. For six years Teno worked for the newspaper, gaining much valuable experience. In 1938 he entered the University of Wyoming as a Journalism and pre-law student. To help out with expenses, Teno and a Rock Springs buddy, Frank Larrabaster, made stencil duplicates of basketball schedules and sold advertising to go with them. During his years at the University, Teno ran a snack bar in his dormitory, waited tables and washed dishes at Annie Moore’s boarding house, tended the furnace, shoveled snow and scrubbed floors. Any job was a good job as long as it helped pay the college expenses. During his second year at the University, Teno was elected Student Body President and got his first taste of politics. His service to the people of Wyoming had to wait, though, since America went to war. In 1942, Teno joined the Army and fought with the First Infantry Division, 18th Regiment, in North Africa. Teno later fought in Sicily, Italy and on D-Day on Omaha Beach in Normandy, France. Teno was also there as the Americans fought Germany and ended the War in Europe. Teno Roncalio would leave the Army a Captain with a Silver Star for gallantry and returned home a hero. That is when his long career as a public servant began. After returning to the University of Wyoming to complete his law degree, Teno would serve his community and state as a Representative in Congress for 5 terms. Source: Teno Roncalio, U. S. CONGRESSMAN FROM WYOMING by Mabel E. Brown. Spread 1 cup pepper sauce in a 13-in. x 9-in. baking dish coated with cooking spray. Top with three noodles, 1-1/2 cups pepper sauce, 1 cup white sauce and 1/3 cup Parmesan cheese. Repeat layers. Top with remaining noodles, white sauce and pepper sauce. Bake, uncovered, at 350° for 30-35 minutes or until bubbly. Sprinkle with remaining cheese. Let stand for 15 minutes before cutting. 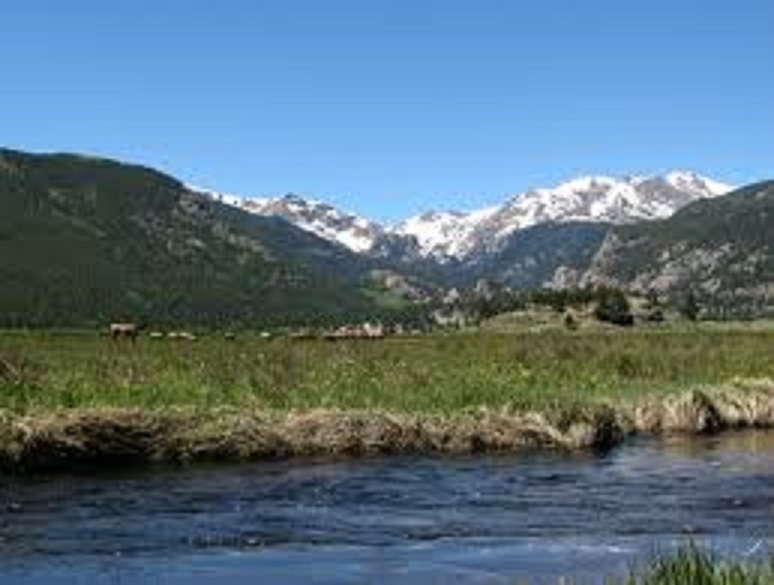 Italians first started coming to Colorado as early as the 1850s. They came for many reasons but the majority — particularly later immigrants — came to improve their lives and the lives of their families. In the late 1800s and the first half of the 1900s, the area in Denver between Broadway and Zuni Streets on the east and west and 46th and 32nd Avenues on the north and south was known as “Little Italy”. It was an area of Italian grocery stores and bakeries, community bread ovens, churches and schools; an area where a new wave of immigrants from all over Italy moved to and where they were comfortable and socially secure in a new country. The area along the South Platte River sandwiched between Denver’s growing downtown and the hills to the west was known as “The Bottoms”. Here many of the first Italian immigrants settled. There was also farmland along the South Platte where they could grow cash crops of vegetables that were then sold in small, neighborhood shops and from push carts and horse-drawn wagons throughout the neighborhoods of Denver. Although created by accident, these neighborhoods combined many elements of wise urban planning and organization — self-contained communities with their own institutions. They offered, first, a cloak of familiarity — the language, customs and foods of the homeland and they fostered valuable social and economic networks, helping the newest arrivals to get established quickly. 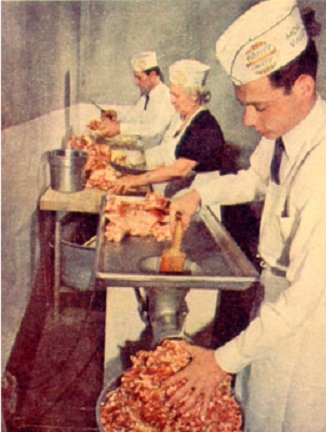 The Denver Post reported that members of the Polidori family have been blending ground pork with just the right balance of salt and spices for more than 80 years. Ensconced in an unpretentious building that includes what was once the carriage house behind the old Coors Mansion in north Denver, Steve Polidori and his sister, Melodie Polidori Harris, are continuing a tradition launched in 1925, when their great-grandfather, Rocco and his wife, Anna, opened Polidori’s Grocery and Meat Market. It was there that Anna first prepared the sausage recipe she brought with her from Abruzzi, her hometown in Italy. Anna came through Ellis Island and ended up in Utah, where she met and married Rocco, who was then a miner. After he fell victim to black lung disease, they moved to Colorado for fresh air. Rocco’s brother owned a grocery store. In time Rocco and Anna bought the store. She became the butcher. From time to time, she would make sausage for her husband and herself. Customers would come in, smell the sausage cooking, ask for samples and, before long, they were asking to buy it. When they could no longer run the store, their sons, Louis and Augie, took over and ran it for almost 40 years. The brother-sister team (the son and daughter of Gary, an attorney, and Ruth Ann Polidori, a retired district court judge) represents the fourth generation to sustain the family business. 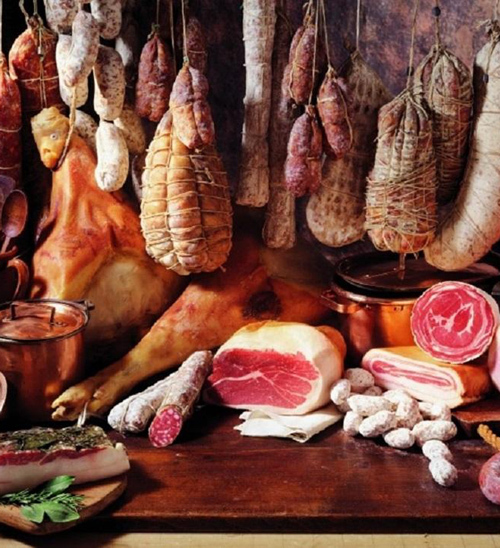 Today, the Polidori twosome are behind the Polidori Meat Processors, a family business that has grown its product line to include chorizo, breakfast sausage, bratwurst and meatballs, in addition to hot and mild Italian sausage. Polidori sausages are now found throughout the metro area. Meanwhile, preheat broiler. Cook sausage in heavy large pot over medium-high heat until no longer pink, stirring frequently and breaking up with back of wooden spoon. Add garlic and sauté until soft, about 2 minutes. Drain off excess oil and return pot to medium-high heat. Stir in marinara sauce and crushed red pepper, then pasta. Season to taste with salt and pepper. 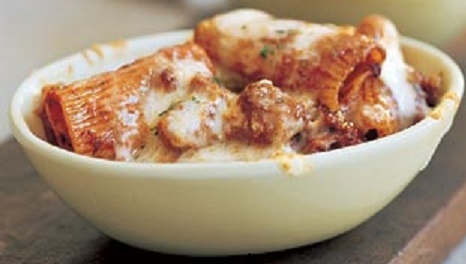 Divide pasta among four 1 1/4-cup soufflé dishes or custard cups. Sprinkle mozzarella and Parmesan over. 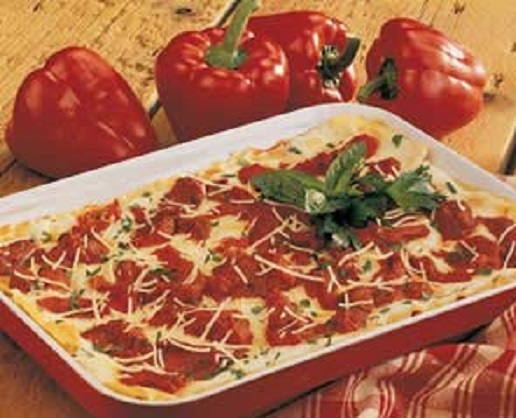 Place in broiler until cheese melts and begins to brown, watching closely to prevent burning, about 1 1/2 minutes. Sprinkle rigatoni with parsley, drizzle with olive oil, and serve. Italian immigrants were one of the largest groups of Europeans to move into Utah. 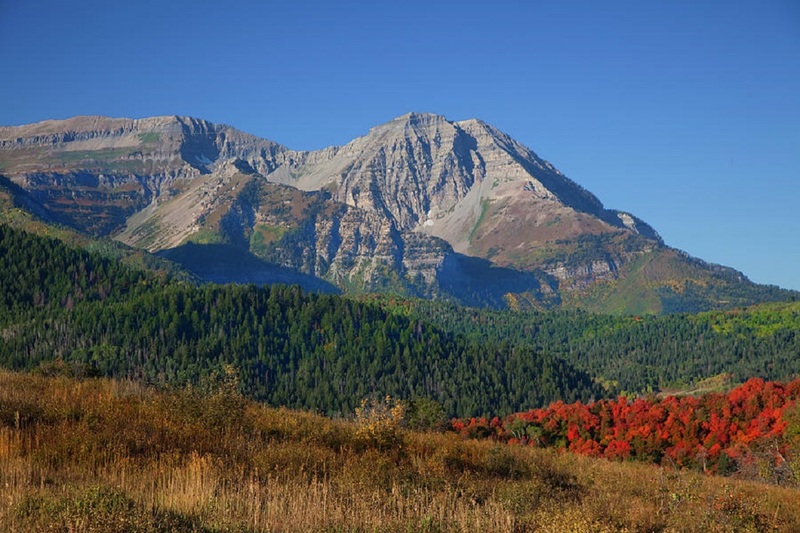 The bulk of Italians came to Utah during the period from the 1890s to the 1920s in response to demands for unskilled labor in the mining and railroad industries. Italians came primarily from the regions of Piemonte, Veneto, Abruzzi, Lazio, Calabria and Sicilia. Immigrants were attracted to four counties, Carbon, Salt Lake, Tooele and Weber. Coal mining, metal mining, work in the mills, smelters, refineries, railroading, farming, ranching and involvement in service-related industries and businesses provided livelihoods for these immigrants. Italian coal miners played an important role in the Carbon County strike of 1903-04 with labor organizer, Carlo Demolli, assuming a leading role for the United Mine Workers of America. From the late 1910s through the 1930s, Frank Bonacci from Decollatura, Italy, led a tireless effort for UMWA recognition. 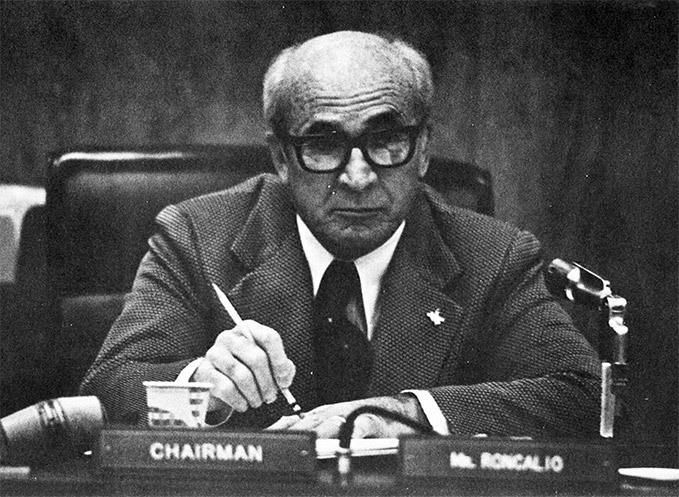 After union recognition was achieved in the 1930s, Bonacci became the first Italian-American elected to the Utah House of Representatives. As an early hub of the D&RGW Railroad, the town of Helper became an important Italian settlement. Joseph Barboglio became especially important as the founder of Helper State Bank, an institution that aided Italians with their economic needs. 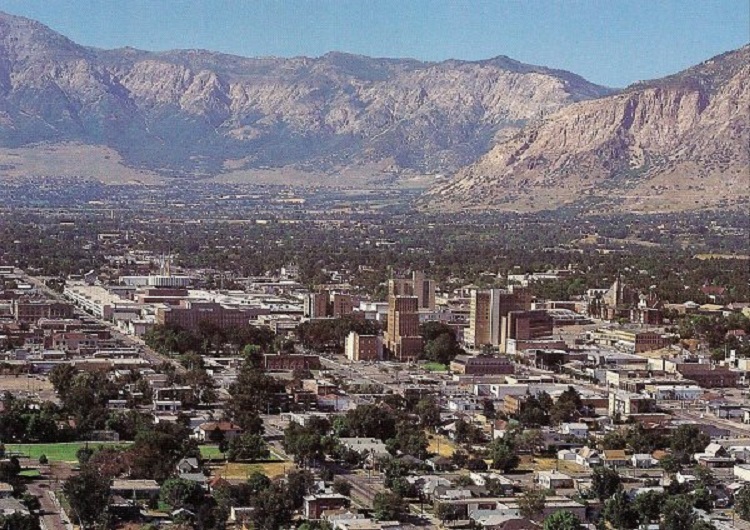 Many immigrants resided in Salt Lake City and in the mining areas of Bingham Canyon, Magna, Midvale and Murray. The west side of Salt Lake housed a “Little Italy” around a cluster of shops and businesses that catered to Italian tastes. One such establishment was F. Anselmo and Company, located on Rio Grande Street. In the south end of the city, immigrants had truck farms that supplied fruit and produce to the Farmer’s Market in Salt Lake City. Others, including Luigi Nicoletti, operated goat ranches that specialized in cheese and meat goods sold to Italian miners. 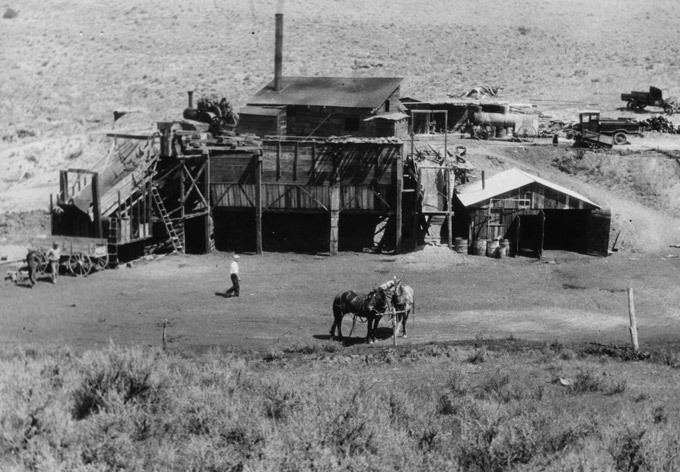 Those who lived in Tooele County found work in the mining town of Mercur, an early central location for Italians and the site of one of their first fraternal organizations. Photographs survive that show bocce (a form of bowling) being played by Italians in the streets. Work was found in the Tooele smelter (run by the International Smelting and Refining Company), where safety signs were printed in Italian and other languages. Italian-language newspapers produced in Utah included Il Minatore, La Gazzetta Italiana, La Scintilla, and Il Corriere D’America. Sunnyside had its own Italian band, complete with a music professor from Grimaldi, Italy. Salt Lake City Italians enjoyed the music of various individuals and bands who often played at dances and celebrations. Even the San Carlo Opera Company managed to give concerts in Utah. Accordion, guitar and mandolin music could be heard emanating from many of the mining camps. Source: Philip F. Notarianni, Italianita in Utah: The Immigrant Experience. Bring the broth to a low simmer in a large pot. In a saucepan, melt the butter and saute the onion over low heat, just to soften and release the flavors. Do not let brown. Add the rice and toast it for one minute, stirring constantly. Add the beer and let it evaporate, stirring the rice as it does. Add one ladle of hot broth and bring the rice to a simmer over medium heat, stirring as you go. Add a ladleful of hot broth as the rice soaks it up, stirring occasionally. Cook for about 15-20 minutes or until “al dente,” where the rice is soft but still has a slightly firm texture in the middle. Add the lemon zest, rosemary, and ginger. Remove from the heat and stir in Parmigiano-Reggiano and mascarpone cheese. Serve immediately, garnished with julienned mortadella slices. Summer is a great time for tomatoes. This is when they are at their best – deep red, juicy and intense in flavor. 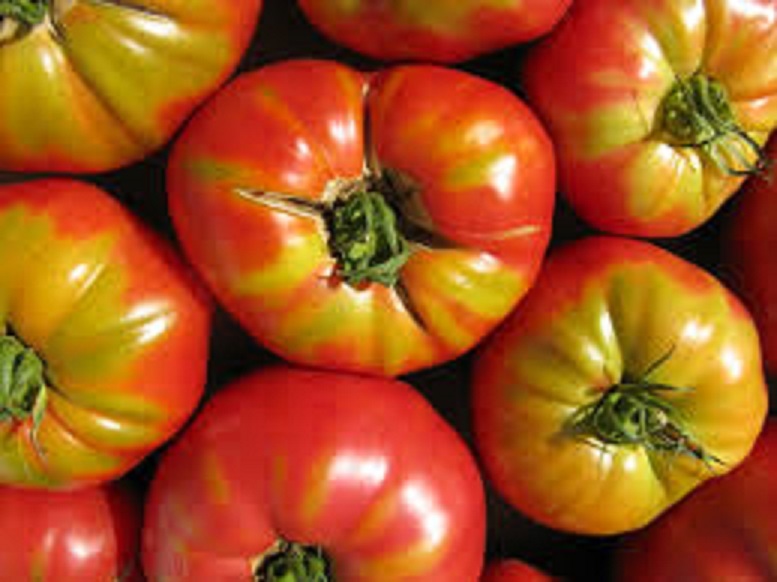 There are Beefsteak, Roma, Vine-Ripened, Grape, Cherry, Heirloom and so many other types of tomatoes. Each has their own flavor and each can be used in multiple ways. Perhaps you grow tomatoes, or you are the lucky recipient of someone who has too many to use or maybe you are indulging in the bounty at the farmers’ market. However, you come by your tomatoes, now is the perfect time to try new and exciting things with them. Of course, you know, you can use fresh tomatoes to make tomato sauce, salsa or bruschetta and, you know, they taste great in salads and sandwiches. Below are a few different ways to use up some of your tomatoes. In a large bowl, place the tomatoes, watermelon, lime juice, mint, salt and pepper. Gently toss the ingredients, cover the bowl and chill 30 minutes to 1 hour. 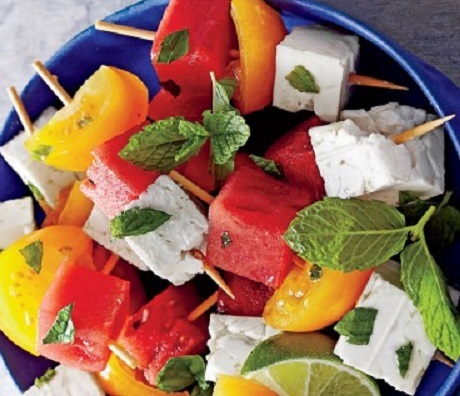 Thread 1 tomato piece, 1 watermelon cube and 1 feta cube onto a skewer and place on a serving platter. Repeat with remaining skewers. Drizzle with the remaining marinade in the bowl and a little olive oil. Serve immediately. Have green tomatoes? Here is something to make instead of fried green tomatoes. Melt butter with oil in a Dutch oven over medium-high heat. Reduce heat to low; add onions and cook, stirring often, 15 minutes. Add celery and chopped green bell pepper; cook, stirring often, 5 minutes. Add garlic; cook, stirring constantly, 1 minute. Add tomatoes, broth and bay leaves. Season with salt and pepper to taste. Increase heat to medium-high, and bring to a boil. 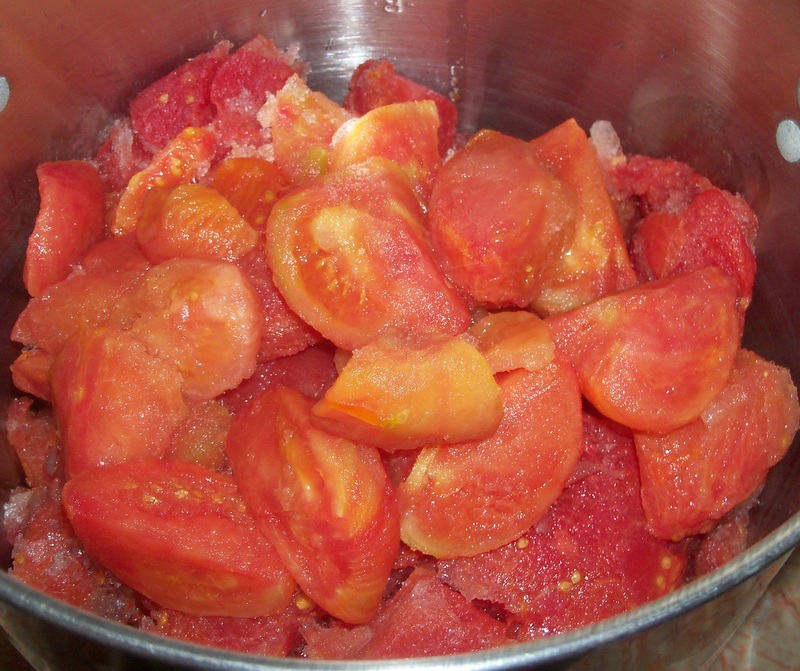 Reduce heat to low and simmer, stirring occasionally, 15 to 20 minutes or until tomatoes are tender. Remove from the heat and discard the bay leaves. Stir in arugula, basil and parsley. Let cool 30 minutes. Process soup with an immersion blender in the pot or, in batches, in a food processor or blender until smooth. Stir in lemon juice and hot sauce and add additional salt and pepper to taste, if needed. Cover and chill 8 to 24 hours. Ladle chilled soup into serving bowls and top each serving with some crab meat and a few slices of hot peppers. Preheat oven to 400°F. Soak corn in the sink or in a bowl filled with cold water for 15 minutes. Prepare vinaigrette by whisking together oil, vinegar, mustard, garlic, chives, salt and pepper. Set aside. Once the corn has soaked, place it on a rimmed baking sheet lined with parchment paper. Roast for 25 minutes or until the corn kernels are tender. Cool to room temperature; then discard husks and silks. Cut the kernels off the cobs and put them in a large serving bowl. 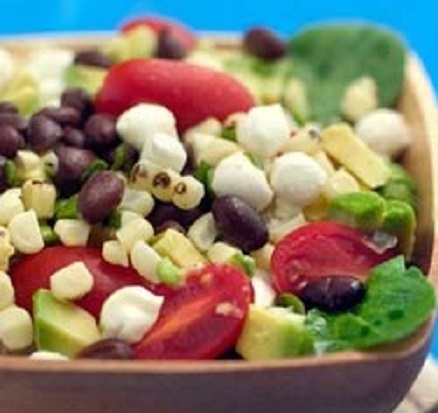 Add mozzarella, tomatoes, olives, avocado, if using, and basil. Drizzle the dressing over the salad. Toss gently to combine. Season with additional salt and pepper, if needed, and serve over a bed of greens. 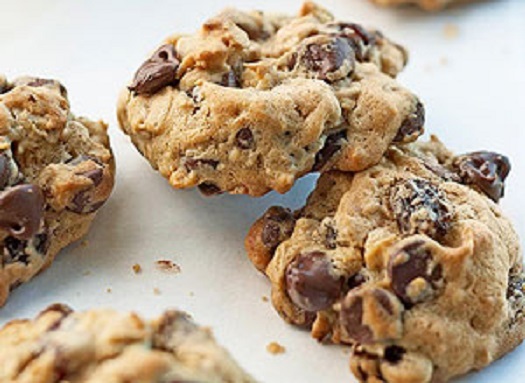 Combine bread crumbs, flour, butter and salt in a food processor until dough comes together. Using your hands, press the dough into a 10-inch tart pan or pie plate. Bake until golden, 10 to 12 minutes. Slice the tomatoes thinly and place on paper towels. Lightly sprinkle the tomatoes with salt so they can release their juices and set aside. In a food processor, combine ricotta, mozzarella, eggs and basil leaves just until blended. 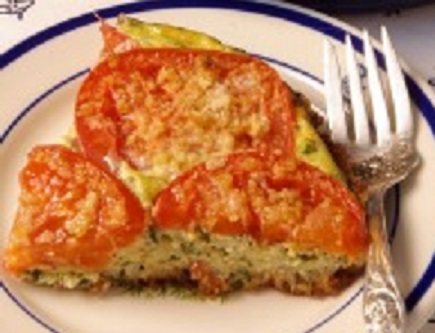 Top the baked tart shell with a layer of tomatoes followed by the cheese filling. 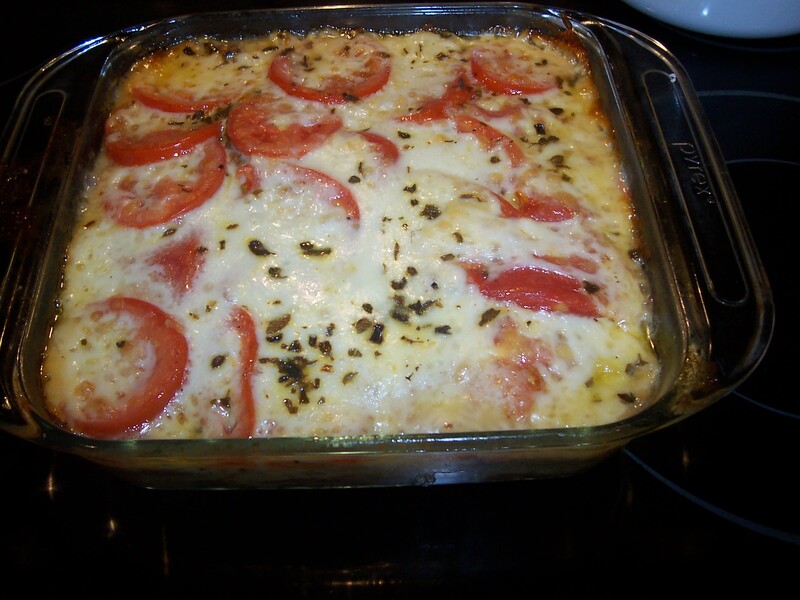 Top with another layer of sliced tomatoes and drizzle with olive oil. Bake the tart until golden brown and set in center, 45 to 55 minutes. Let rest for 15-20 minutes before cutting. Bring a large pot of salted water to a boil and cook pasta until al dente. Drain and toss with the olive oil. Set aside. Preheat a large skillet. Cut the casing off the sausage and add it to the pan, crumbling it into small pieces. Add garlic and cook until the sausage is browned and cooked through, 7 to 10 minutes. 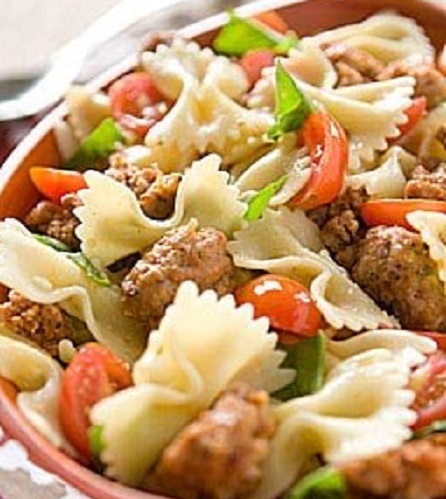 Add cooked sausage to the pasta with the basil, tomatoes, cheese, lemon juice, salt and pepper. Serve warm or at room temperature. The key to making a delicious burger is to keep things simple. Many failed burgers are the result of overcomplicating the process. If you start with good-quality ingredients and apply basic grilling techniques, then you really don’t need to do much to turn out a delicious burger. Use high-quality ground meat (go for grass-fed beef, if you can; it has more flavor) that has some fat content (80 to 20 ratio of lean-to fat), which is needed to keep the burger moist and to enhance its flavor. Handle and cook the burgers with care. Other types of ground meat, particularly lean meats, like chicken or turkey, may need a few extra ingredients to achieve the same results. When you’re forming burger patties, be gentle with your ground meat mixture. If you pack the meat too tightly, the density will make the patty seem tough. Form the burger into a round that is the same size as your bun (it will shrink as it cooks) and then very gently press the middle of the patty to form a small dent — this helps the patty retain an even thickness during the cooking process. Salt can draw moisture out of the meat mixture, so don’t add it to the ground meat. Instead, season both sides of a burger just before cooking. 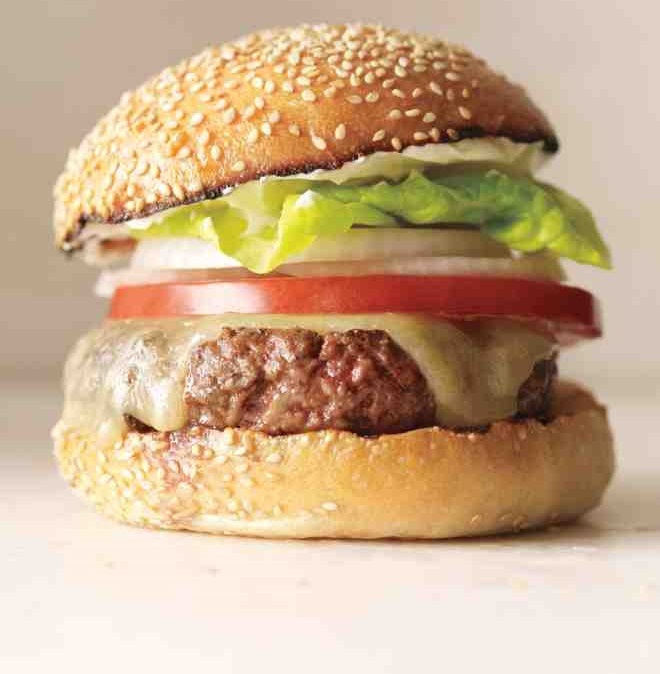 Medium heat is best when it comes to burgers; if you cook your burger at too high a temperature, it can cook unevenly. Don’t be tempted to press on the burgers as they cook (since they won’t puff up as much in the center) and turn the burgers gently as they cook, so you don’t lose meat juices and flavor. 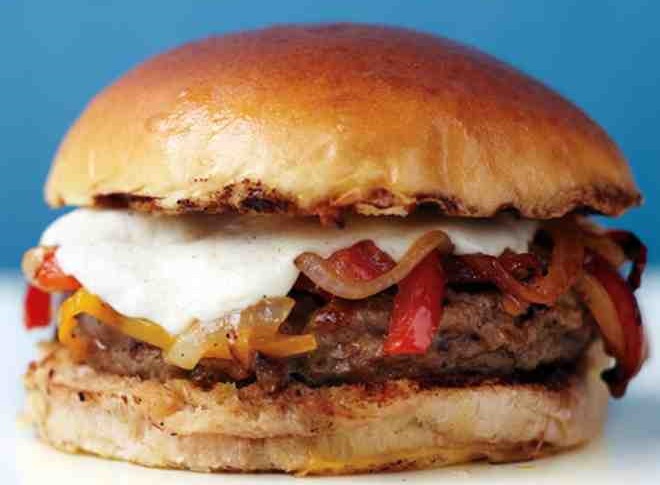 Here are some burger recipes to suit all tastes. Preheat grill to medium-high; brush grates with oil. Gently form beef into four 1-inch-thick patties, about 4 inches in diameter. Make an indentation in the top of each patty. Generously season both sides with salt and pepper. Grill burgers 3 minutes. Turn, top with cheese, and grill 3 minutes for medium-rare. Toast rolls face-down on the grill until just lightly browned, about 30 seconds. Sandwich burgers in rolls with tomato, onion, lettuce and condiments. In a large skillet, heat 1 tablespoon oil over medium. Add onion, bell pepper and celery; season with salt and pepper. Cook, stirring occasionally, until tender, 8 to 10 minutes. Transfer to a medium bowl; cool to room temperature. Add chicken to vegetable mixture in the bowl. Mix to combine. Shape mixture into four 4-inch-wide patties. Brush burgers with remaining oil and sprinkle the burgers with 1/2 teaspoon salt and 1/4 teaspoon pepper. Heat a grill to medium-high. Clean and lightly oil the grill. Grill burgers until browned and cooked through, 6 to 8 minutes per side. 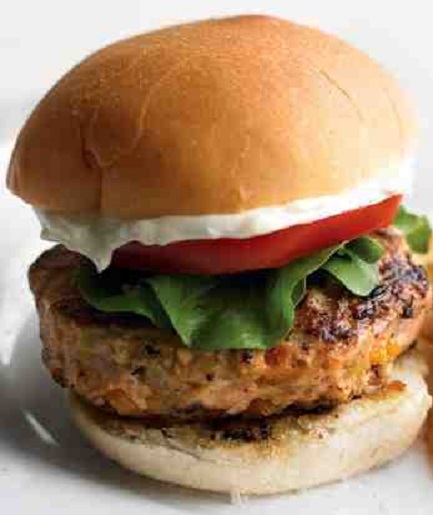 Place chicken burgers on buns and top with lettuce, tomato and mayonnaise or sauce of choice. Heat a grill to medium-high. Clean and lightly oil the grill. In a bowl, mix pork with fennel seeds. Form into 4 patties. On a large piece of foil, combine oil, peppers and onion. Season with salt and pepper. Fold foil around the vegetables and crimp ends. Grill the foil packet until vegetables are crisp-tender, about 8 minutes. Season patties with salt and pepper. Grill until cooked through, about 6 minutes per side. In a medium bowl, mix the vegetables with vinegar. Top each patty with vegetables and a slice of mozzarella. Cover grill and cook until cheese is bubbling, about 1 minutes. Condiments of choice: cheese, horseradish sauce, etc. Cut tuna into 1/4-inch chunks with a very sharp knife, trimming away any dark parts. Coarsely chop tuna by hand until it begins to hold together. Transfer to a bowl over a bowl of ice. Add garlic, olive oil, sesame oil, anchovy, basil, celery, ginger, salt and pepper; combine well. Chill for up to 6 hours until ready to cook. Heat grill to medium high and oil the grill grates. 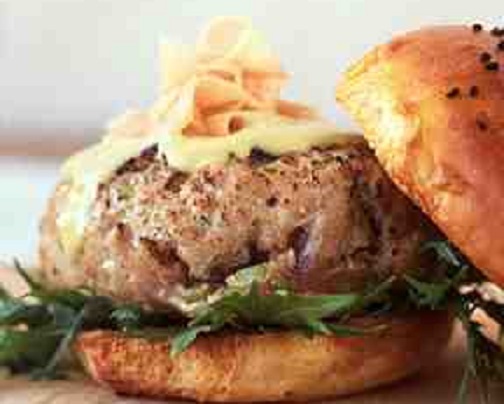 Form tuna into 6 patties and place on the grill, 4 minutes per side for rare to 7 or 8 for well done. Serve with arugula on toasted buns brushed with mayonnaise or other condiments. Heat a grill to medium-high and lightly oil the grill grates. In a medium bowl, mix lamb, cumin and coriander. Form into 4 patties. Coat the burgers with olive oil and season with salt and pepper. Grill 4 minutes per side for medium-rare. 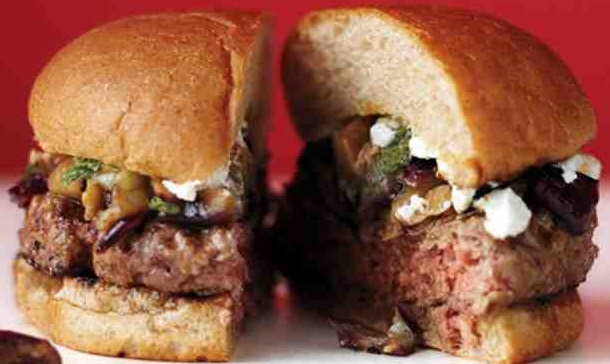 Serve burgers on buns with crumbled feta cheese and chopped olives. 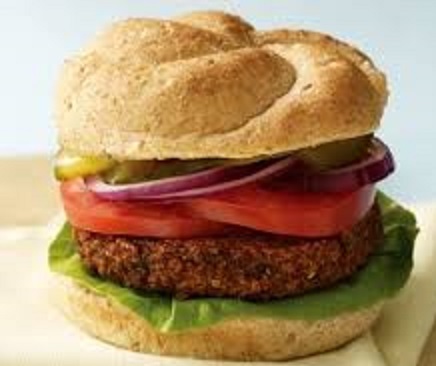 These burgers are great if you are cooking for vegetarians and non-vegetarians. 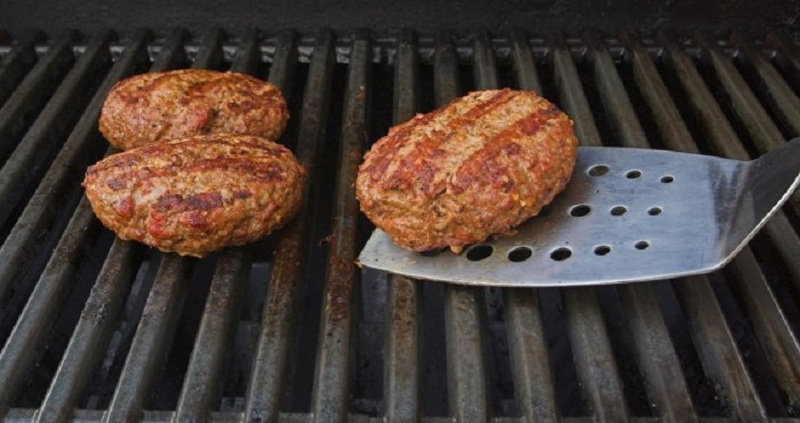 The meat burgers can go on one side of the grill and the bean burgers on foil can go on the other side of the grill. In order to keep veggie burgers from falling apart on the grill, make sure all the ingredients in the burger are thoroughly dry before combining them. 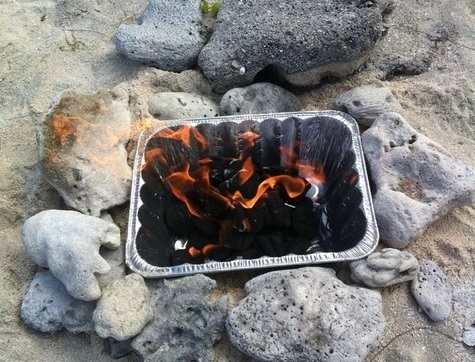 Preheat an outdoor grill for high heat and lightly oil a sheet of aluminum foil. Dry black beans well on paper towels. In a medium bowl, mash the black beans with a fork until thick and pasty. In a food processor, finely chop bell pepper, onion and garlic. Place on paper towels to dry well. Then stir into the mashed beans. .In a small bowl, stir together the egg, chili powder, cumin and hot sauce. Stir the egg mixture into the mashed beans. Mix in the bread crumbs until the mixture is sticky and holds together. Divide mixture into four patties. Place patties on oiled foil and grill about 8 minutes on each side. Freezing vegetables is a fast and easy form of preserving food, such as asparagus, broccoli, green beans, peppers, summer squash, tomatoes and berries. According to the National Center for Home Food Preservation (NCHFP), fruits and vegetables will last in the freezer for eight to 12 months if prepared and stored properly. 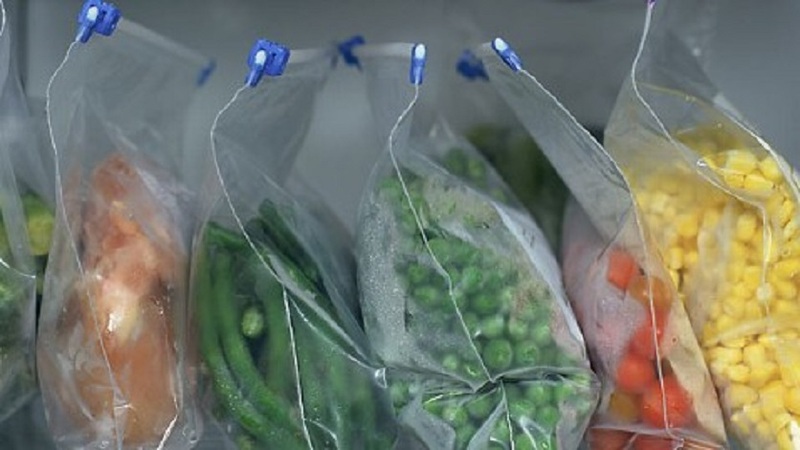 Vacuum-seal bags cost more than regular freezer bags, but advocates say they are worth the extra expense because they make frozen foods last even longer. Most freezer bags are made of No. 4 LDPE (low-density polyethylene), which is not known to leach chemicals. If you’re worried about putting hot food into plastic, however, wait until the food cools before packing it into bags. Freezer bags are ideal because they can lay flat in the freezer and not take up too much room. 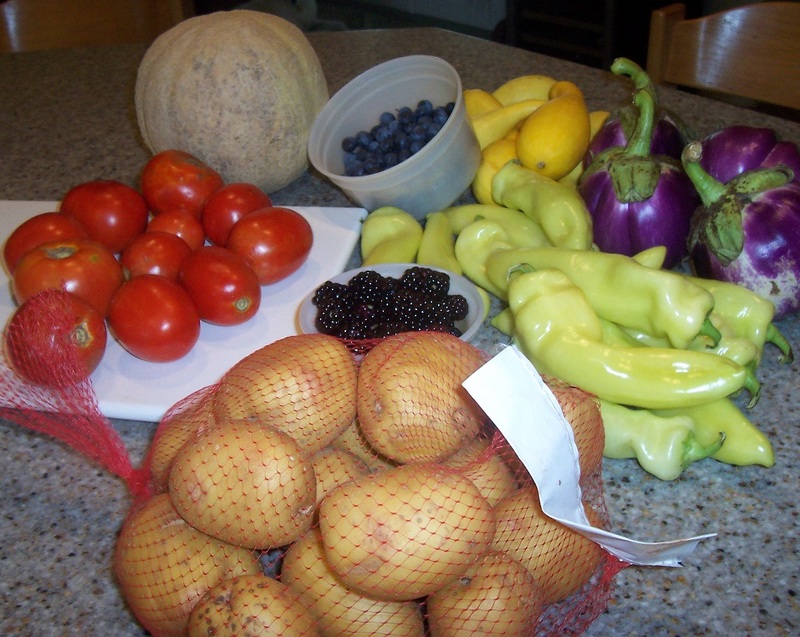 Only freeze fruits and vegetables that are in excellent condition and that have been thoroughly cleaned. Some vegetables you plan to freeze should be blanched for a few minutes. Blanching — the process of heating vegetables with boiling water or steam for a set amount of time, then immediately plunging them into cold or iced water — stops enzyme activity that causes vegetables to lose nutrients and change texture. The cooled vegetables can then be packed into freezer-safe storage containers. Fruits or blanched vegetables can also be patted dry with clean kitchen towels, frozen in a single layer on cookie sheets and, then, put into containers. Using cookie sheets for freezing ensures that the fruits and vegetables won’t all stick together, thus allowing you to remove a handful at a time from the container. Get a blanching pot, which has a basket and cover, or fit a wire basket into a large pot with a lid. Boil 1 gallon of water per pound of vegetables in the pot. Lower the basket of vegetables into vigorously boiling water and cover with the lid. The water should resume boiling within 1 minute; if it doesn’t, you have too much vegetable or too little water. Start the blanching time when the water returns to a boil. As soon as the recommended blanching time elapses, pull the vegetable basket out of the boiling water and plunge it into cold water (60°F or colder) for the same length of time as you blanched them. 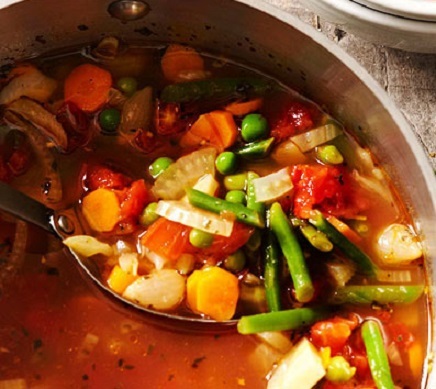 Drain the vegetables thoroughly after cooling—extra moisture ruins the produce in the freezer. Package in freezer containers. This is the fastest, easiest method of freezing vegetables. It was originally thought that this method was acceptable only for chopped onions, peppers, fresh herbs or vegetables that were to be stored for less than 1 month. But I have found that many unblanched, frozen vegetables can be stored for up to twice as long and still maintain good color, flavor and texture. Try this method with onions, peppers, herbs, celery, corn in husks, cabbage, sugar snap peas, summer squash, young tender broccoli and green beans. It is the preferred method to use with berries. It can also be used with high quality fruits, especially ones you plan to use semi-thawed or baked in a dessert such as a crisp or a crumble. 1. You will need a scrubbing-brush, towels, freezer bags and a labeling pen and tape. 2. Select vegetables that are slightly immature. Wash the vegetables and drain on towels. 3. Prepare the vegetables: slice, dice, chop, Julienne or leave whole. Leave berries whole; peel and slice or chop other fruit. 4. Pack in freezer bags, expelling as much air as possible. Label with the name of the fruit or vegetable and date. 5. Freeze in a single layer in the coldest part of the freezer. 6. The best methods of cooking vegetables frozen in this manner are stir-frying and steaming. It’s pepper season, which means that you will find plenty of peppers at the market for a very reasonable price. Buy extra and freeze them for the winter months when fresh peppers are expensive – especially the red ones. All you have to do is slice the upper fourth of each pepper off, remove the peppers’ ribs and seeds, place the gutted peppers — along with their tops — inside freezer bags, then expel the air from the bags, seal tight and place them in the freezer. Wash red peppers and cut out any blemished spots. 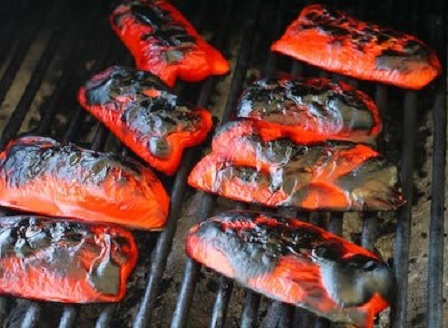 Place whole peppers on a hot grill or under a hot broiler. Use tongs to turn peppers as needed until they’re blistered on all sides with brown and black patches. 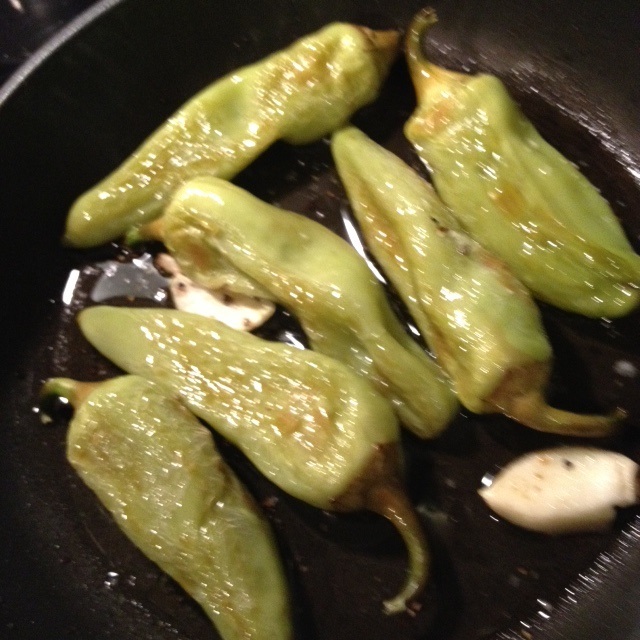 Place the hot, roasted peppers in a large pot with a lid or enclose them in a paper bag. Allow them to cool. When the peppers are cool, use your hands and a table knife to remove loose pieces of skin. Cut peppers in half and remove cores. Freeze the roasted peppers on cookie sheets and then pack into freezer-safe containers. Roasted peppers can be used for dozens of recipes. Stand the frozen peppers upright in a Dutch Oven. Next, heat the rice in the oil in a frying pan and when the rice begins to turn brown add the garlic and onion. When both are browned, add the ground beef to the pan, break the meat into small chunks and cook until brown. Stuff each peppers about half full with the rice-onion-beef mixture. Wipe out the pan and empty the can of tomato paste into the pan. Heat the paste until visibly darkened, stirring constantly. Add three cups of water to the pan, stir to dissolve the browned paste and add salt and pepper to taste. 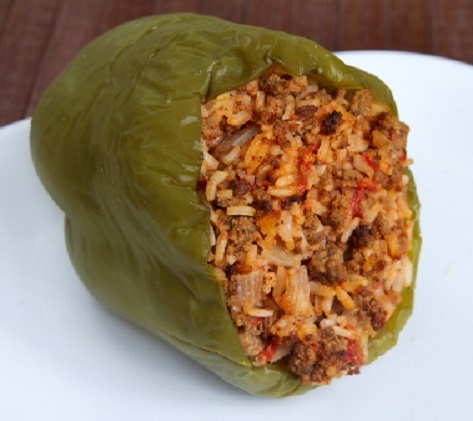 Pour the tomato sauce into and around each of the stuffed peppers so that they are filled with and standing in liquid. Put the tops back on the peppers, cover the saucepan tightly and cook over low heat until the rice is done (30 to 45 minutes). Experts recommend blanching sweet corn before freezing it, which locks in taste, texture and nutrition. You can freeze whole, blanched ears, if you have freezer space, or cut the kernels from blanched, cooled ears and freeze only the kernels. I save some of the cobs and simmer them in water to cover and to make corn broth. 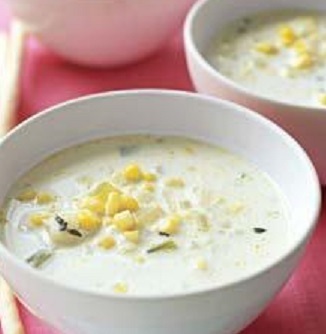 Corn broth is a great base for vegetable soups and chowders. For corn that’s ready to heat and eat in the winter, try this easy roasting method. Cut the corn kernels off a dozen or more ears. Spread the kernels out in a big baking pan, dot with 8 oz of butter cut into small pieces and add enough milk to cover the bottom of the pan. Bake at 350 degrees Fahrenheit until piping hot, stirring every 10 minutes. After the roasted corn cools, spoon the mixture into freezer bags. In a large saucepan, over medium-low heat, fry the bacon until browned but not crisp, about 5 minutes. Spoon off and discard all but 2 tablespoons of the drippings. Add the leek, thyme leaves, salt and pepper. Cook for 5 minutes. Add the milk and potatoes. Simmer gently until the potatoes are almost tender, about 15 minutes. Add the corn and cook for 5 minutes. Add the nutmeg and ladle into bowls. When it comes to tomatoes I take the easy way. I prefer to quarter and core the tomatoes and place them, uncooked, in gallon freezer bags. These tomatoes are excellent for making tomato sauce or soup. No extra work removing the skins before freezing, because after being frozen the skins slip right off after I take them out of the freezer. Saute onion and garlic in olive oil until tender in a large Dutch Oven., Add tomatoes and seasonings. Heat on medium to boiling, reduce heat to low, cover and simmer for at least 2-3 hours, stirring every 30 minutes. For a thicker consistency, remove the lid and raise the heat to medium and cook until more liquid evaporates. The longer this sauce simmers the better it is. Despite their profusion in the garden, summer squash — including zucchini, yellow squash and patty pans — are lightweights in the flavor department. They’re also spoil rapidly. I like to hollow out zucchini squash for stuffing and steam them before freezing. They are then ready for stuffing and baking throughout the year. The standard procedure for freezing summer squash is to blanch half-inch slices in boiling water or steam for three minutes. However, I don’t care for them prepared this way since they get mushy when cooked after being frozen. Another method for freezing summer squash is to slice zucchini horizontally into large, flat slices before blanching. These can be grilled or used to make roll-ups. You can also freeze grated squash to add to baked goods. 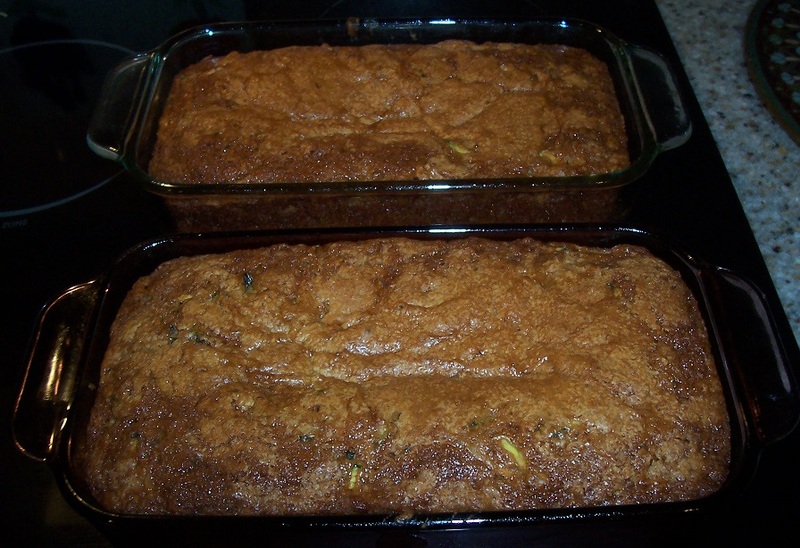 Zucchini bread is excellent made with frozen, shredded zucchini. Defrost the zucchini in the refrigerator overnight or if you forget just defrost it in the microwave. You may want to double the ingredients and make 2 loaves. In a small bowl, beat the sugar, applesauce, oil, egg whites and vanilla until well blended. Combine the flour, cinnamon, baking powder, salt, nutmeg and baking soda; gradually beat into the sugar mixture. Fold in zucchini and walnuts. Transfer to an 8-inch x 4-inch loaf pan coated with cooking spray. Bake at 350° F for 50-60 minutes or until a toothpick inserted near the center comes out clean. Cool for 10 minutes before removing from the pan to a wire rack to cool completely. Yield: 1 loaf (12 slices). You can freeze most types of snap beans, including yard-long beans. The more substantial the bean, the better they are for freezing. For example, pencil-thin green beans soften too much when blanched and frozen, but bigger, firmer green beans are fine. After blanching green beans, you can put them directly into freezer containers, or pat them dry and freeze them on a cookie sheet before placing them in freezer bags. 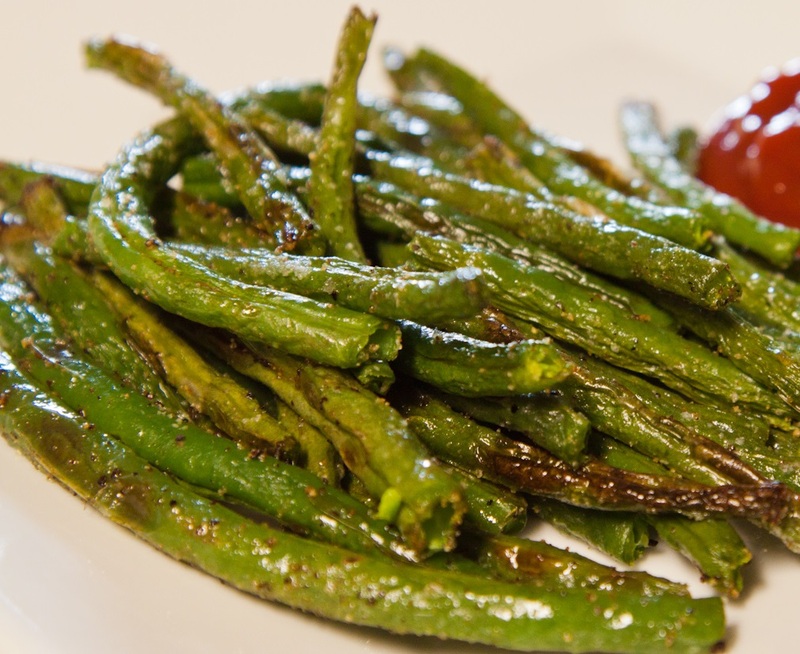 When cooking thawed green beans, use a “dry” cooking method, such as braising them in a little butter or olive oil, instead of cooking them in boiling water. Preheat the oven to 425 degrees F. Line a baking sheet with foil or parchment and spray with olive oil cooking spray. Place the bag of green beans in the microwave for 3-4 minutes or until just thawed (or you could leave them out at room temperature for a few hours). Place the beans on the prepared baking pan, making sure they are evenly spread out and none are laying on top of each other. Place the pan in the preheated oven and bake for 15 minutes, or until golden brown and crispy. 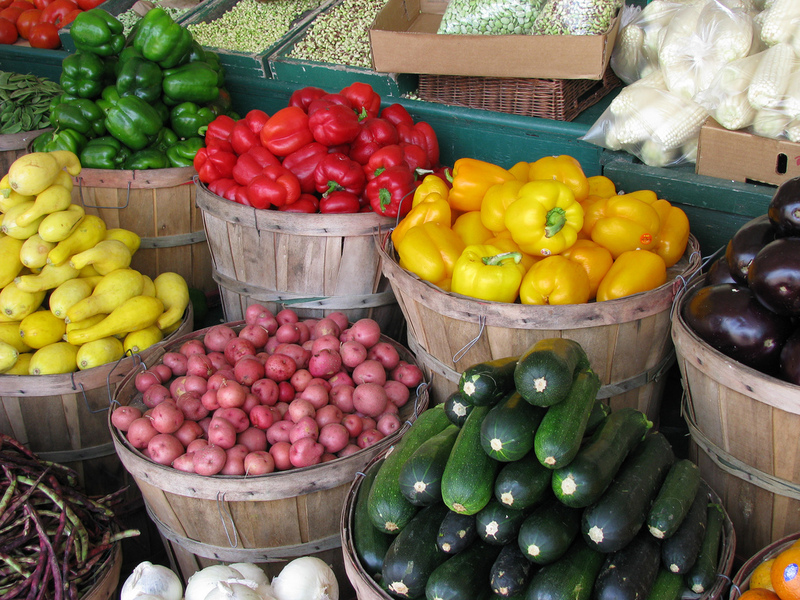 Take a trip to your local farmers’ market and check out all the fresh fruits and vegetables it has to offer. You will quickly see all the possibilities that you can make for dinner. In fact, I have to stop myself from buying more than I can cook in a week – it all looks so good. Here are some easy dinner suggestions to use up what you bring home from the market. Chop basil (will yield about 6 tablespoons) and tomatoes coarsely. Place tomatoes and 2 tablespoons of the basil in food processor (or blender); process and set aside. 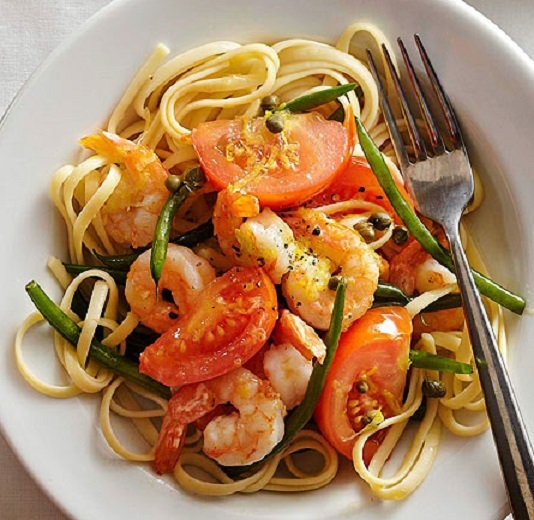 Combine in a shallow bowl: 1 tablespoon of the oil, 2 teaspoons of the garlic and remaining 4 tablespoons of basil. Add chicken and turn to coat evenly. Marinate 10 minutes, turning occasionally. 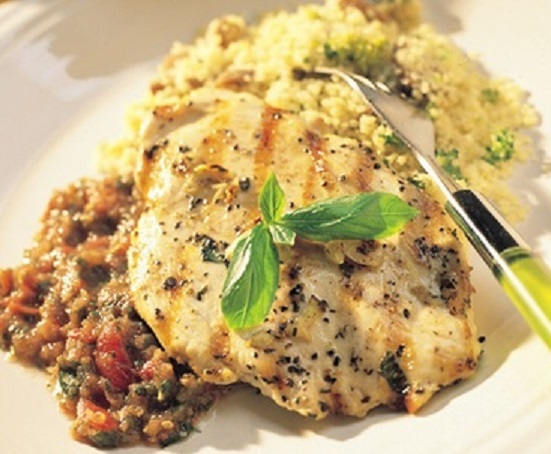 Place chicken on the grill and discard any remaining marinade. Close the lid and grill for about 10 minutes, depending on the thickness of the chicken or until the internal temperature of the chicken reaches 165°F. Use a meat thermometer to accurately ensure doneness. To the processed tomato-basil mixture add the remaining 1 tablespoon oil, vinegar and remaining garlic, 1/2 teaspoon salt and 1/4 teaspoon pepper; pulse 2-3 times or until just blended. Serve sauce with the chicken. Heat the oil in a medium saucepan over medium-high heat. Add the shallots and cook until softened, about 2 minutes. Stir in the garlic and cook until fragrant, about 15 seconds. Stir in the broth and lemon zest. Bring to a boil. Stir in the couscous and peas and remove the pot from the heat. Cover and let stand for 5 minutes. Fold the parsley and lemon juice into the couscous. Season with salt and pepper to taste and serve alongside the chicken. In a Dutch Oven, heat oil over medium heat. Add fennel and onions; cook for 3 to 4 minutes or until fragrant and translucent. Add green beans and carrots; cook for 3 minutes, stirring frequently. Add broth, undrained tomatoes, wine and Italian seasoning. Bring to boiling; reduce heat. Simmer, covered, for 25 to 30 minutes. Add peas and simmer about 5 minutes more or until the vegetables are tender. Season with salt and pepper. Serve in individual soup bowls. In a medium-sized bowl, combine corn, basil, ricotta, eggs, flour and a pinch of black pepper. Carefully add spoonfuls of the corn mixture to the hot pan. Cook on both sides until golden brown. 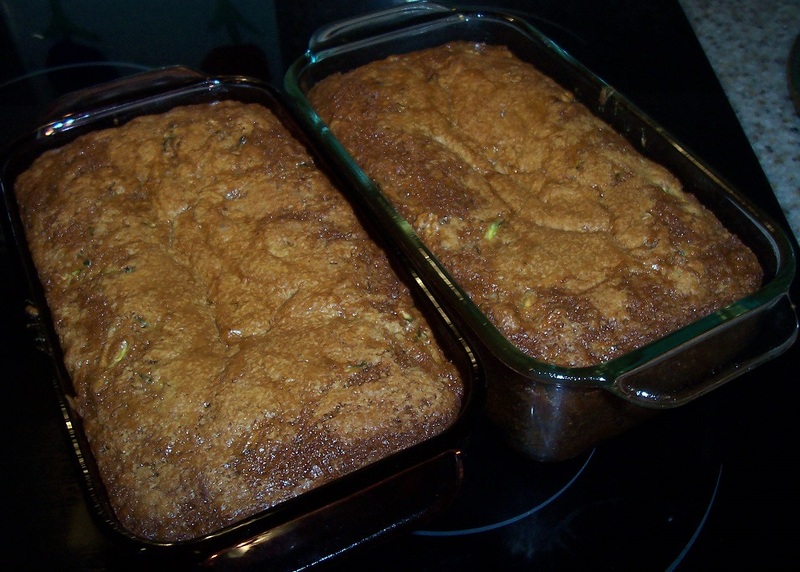 Remove cakes to a serving platter when they finish cooking. Serve with low-fat sour cream or Greek yogurt on the side, if desired. In a medium saucepan combine broth, bulgur and onion. Bring to boiling; reduce heat. Simmer, covered, for 12 to 15 minutes or until the liquid is absorbed. Stir 1 teaspoon lemon-pepper seasoning, the spinach and roasted peppers into the bulgur mixture. Cover and keep warm. 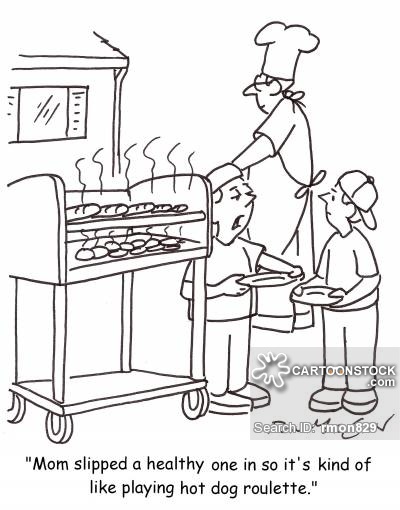 Preheat an outdoor grill to high and oil the grill grates. Turn off one side of the grill for indirect cooking. Trim fat from the meat. 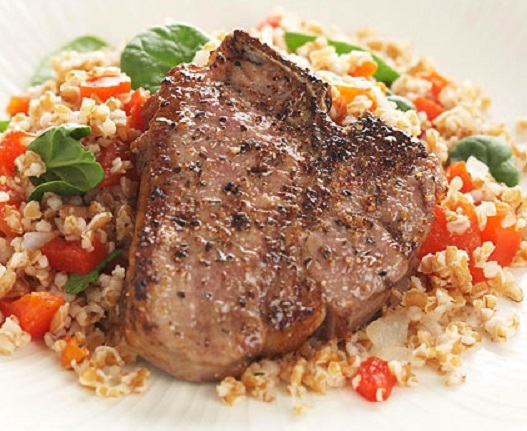 Brush the chops with olive oil and sprinkle the meat with 1 teaspoon of the lemon-pepper seasoning. Start the lamb on the indirect side of the grill. When the meat reaches 110°F for medium-rare on an instant read meat thermometer, moved the chops to the hot side of the grill. They’ll quickly sear and come up to the desired temperature of 120°—130°F. Let them rest for 10 minutes off the grill on a platter before serving. To serve: Divide bulgur mixture among 4 dinner plates. Top each with a grilled lamb chop. 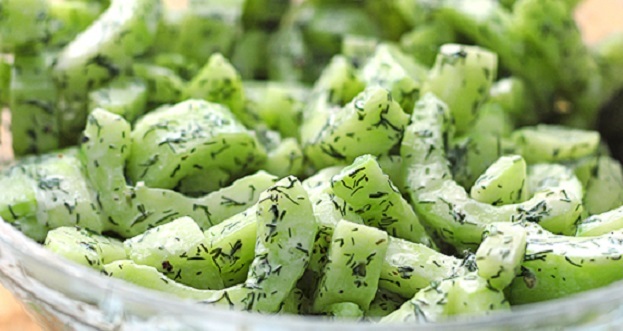 Place the cucumber slices in a colander set over a bowl and toss with the salt; let stand 15 minutes. In a medium bowl, combine yogurt, dill, vinegar and pepper. Remove cucumbers from the colander and pat dry with paper towels. Add to the bowl with the yogurt dressing; toss to combine and serve with the grilled lamb chops. Bread sticks would be great with this dinner. Cook the pasta according to directions for al dente. Drain. In a small bowl whisk together 2 tablespoons olive oil, the lemon peel, lemon juice and capers. Set aside. In a 12-inch skillet heat 1 tablespoon of the olive oil over medium-high heat. Add the green beans and Italian seasoning to the skillet; cook and stir for 3 minutes. Add shrimp; cook and stir about 3 minutes or until shrimp are opaque. Add tomatoes; cook for 1 minute more. Add the cooked pasta and the sauce. Toss gently and serve. Preheat the grill to high and oil the grates. Turn off one of the burners for indirect cooking. Place peppers and onions in the center of the foil sheet. Top with the sweet potatoes, seasoned salt, pepper and cheese. Bring up foil sides; double-fold the top and the ends to seal the package. Place on the grill (seam side up) over indirect heat; grill 30 minutes or until the fries are hot and the cheese is melted. Combine artichokes, onions and garlic in a small skillet. Heat on low and, then, keep warm until the steaks are cooked. About 10 minutes before the potatoes are cooked, plan on cooking the steaks on the direct side of the grill. Place the steaks on the direct side of the grill and cook 5 minutes; turn and cook 3-4 minutes more minutes or until the temperature of the meat reaches 125°F on an instant read meat thermometer for medium rare. 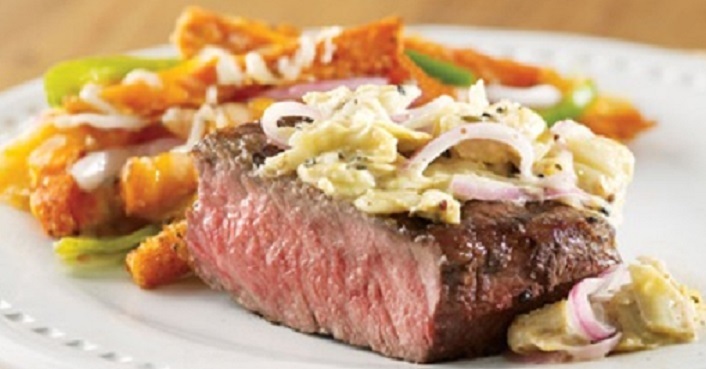 Remove steaks from the grill and place them on a serving platter. Let stand 5 minutes; slice and top with the warm artichoke mixture.